It’s that time of the year again. The wedding cards are being printed, for some of you it’s being sent out, the menu is being tasted and decided, the dress trials are on and so is the hunt for the best makeup artist, frantic calls are made to the best friend and cousins for their solacing words, the venue is obviously set, and the thrill of a new life is setting in. 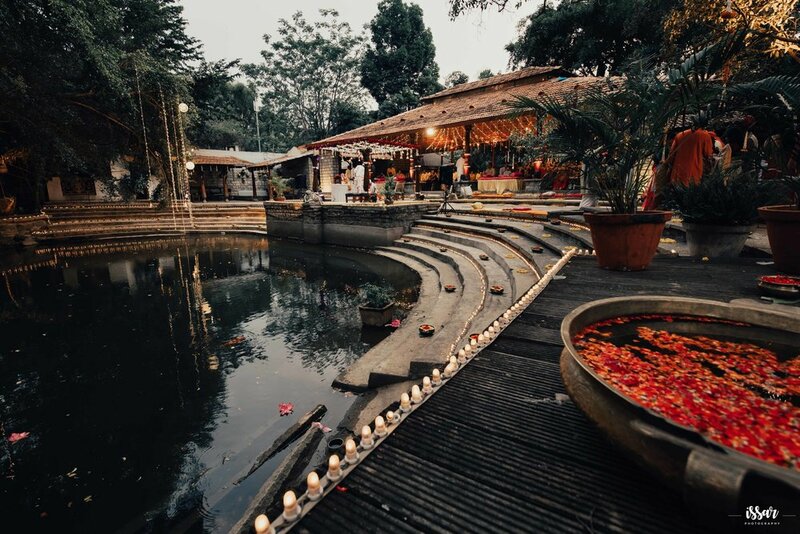 While you rummage through an endless list of guests, let us do a bit from our side to help you with some mandap décor ideas, the auspicious area from where you would be starting a new life. Not everyone is fond of bold colors and we get it. After all, that’s the trend being set by some of the most followed influencers and celebrities. Pastel shades are an absolute favourite in today’s time, with colors like baby pink, powder blue, lavender, daffodil yellows, blush peach, and mint green taking preference over the otherwise traditional color of a wedding decor. In order for the decor to stand out, you could use fresh flowers that match the color theme of your decor, and use soft white lighting. Softer hues tend to go best with cooler lighting than a warm tone. Add a few sophisticated standalone showpieces and there is no denying of your mandap being added to the wishlist of someone soon to get married! Nothing really beats simple sophistication. Basic marigold colours, a few relevant installations, some dupattas and flowers, or may be that one chunky chandelier in the middle of it all. The only way to nail a simplistic mandap is to not really delve into too much. A maximum of 2 colours in say 70-30 ratio, with the 70% being taken be a milder. And we don’t mean just the sunlight during a day wedding, but the use of lanterns, diyas and candles during the evening. Not only does it look aesthetically pleasing, diyas and candles, give a perfect glowy look to the complete environment. To take things a notch higher, use scented candles and diffusers to enhance the vibe of the natural lamps. There is a catch with using diyas and candles - one must be very careful with not to use decoration that could catch fire easily and is the vicinity of the fire. Keep fire safety handy for any sort of emergencies. While weddings have always been done to the whims and fancies of the bride, the trend is surely changing. Love can only exist where there is equality. The both of you may not be on the same line of thought always, and the decor ideas can be one. While you cant have two themes in one wedding, what you can have to solve a possible cute fight as soon as the wedding bells start ringing is using a mix of colours that matches the different personalities of the both of you. Talk to your wedding planner so you can come up with a combination no one has ever seen or imagined before! Most often that not, a single colored theme decoration also looks magnificent if done right. The best part of using a single color is the options you get when it comes to using more of decor items. With the color being constant, a little extra decor items will not cause any harm. From tea lights to LEDs, dupattas to floral installations, tree decor to even floor decor, there is so much one can do while using a single color for the wedding decor. Pro tip - Opt for a softer colour or something more medium rather than a color too loud. Flashy weddings are a thing, but a loud decor is not the route to one. No one can say no to flowers. Its fresh, its surreal, and it’s aroma can keep anyone feeling refreshed for long amounts of time. While you could be adventurous and play with the colours and shapes of flowers, our suggestion would be colorful flowers but from the same family. A little bit of uniformity at times can be a safer decision than the mandap ending up looking haphazard. A thoughtful call is necessary as there may not be enough inventory at the last moment to arrange for flowers if the decor ends up looking messy. Also, fresh flowers are a must! If you are having an outdoor wedding, let your happiness show in the form of all things color! From crockery to seating to balloons to even your clothes, a bright, colorful outdoor wedding is nothing short of a fairytale one. When it comes to the mandap too you can opt to go all colorful, matching it with the colours of your outfit. There are many ways you can choose to decorate a mandap, but being sure of what you want is necessary before you take the final call. 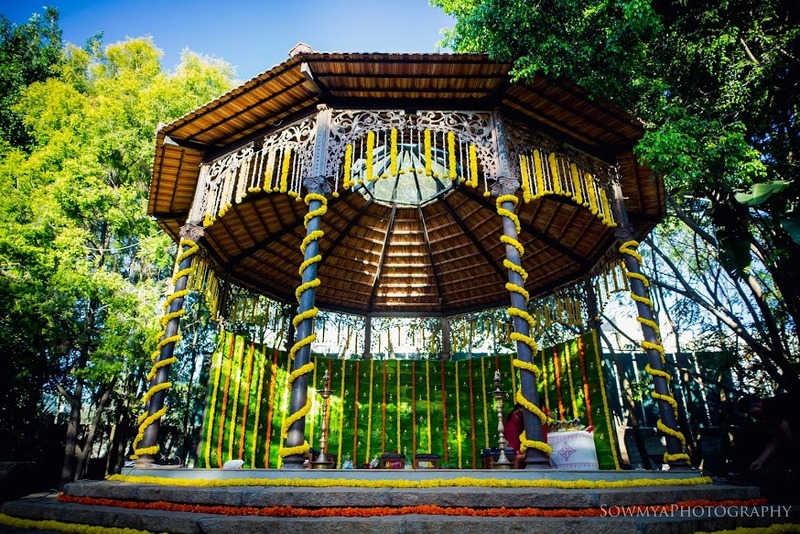 Do your research for some beautiful mandap decor ideas, plan out the theme, decide on your outfit, look for a venue to match your dreams, and then take a call on the final decor. After all, it’s not a cakewalk!